If you’re a big slots fan then you will not be surprised to see a slot game released with the word “safari” in it. I mean, let’s look at the statistics. First off, we have Playtech’s scorching Safari Heat slot, then there is the visually beautiful Safari Sam from Betsoft Gaming, not forgetting the underrated Safari Spirit slot from Ainsworth and we also have the bizarrely named Photo Safari from Play ‘n’ Go. 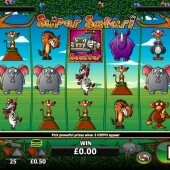 Is this any different to the vast numbers of other safari-themed slots out there? Initially, you would have to say there isn’t. I mean, even the basic facts of the game suggest this won’t win any innovation awards. Actually, there is one piece of innovation in this slot. It has King of the Jungle Re-Spins… which is strange because I never knew there was a jungle on a safari! Anyway, this slot is a 5 reel, 25 pay-line slot from online slot developer NextGen Gaming and from the off it does not thrill me to the extent that I want to play it any more than I have to. 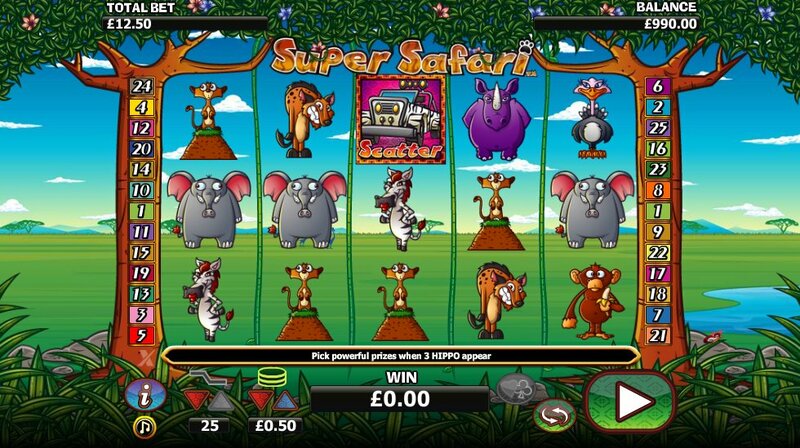 The reels are what you would expect from a safari-themed slot with various animals and creatures from the savannah making their presence known on the five reels. There are zebras, rhinos, monkeys, hyenas, crocodiles (or alligators… how do you tell the difference again? Something to do with the nose?!) and, of course, lions. Maybe I am being a bit harsh on this slot that has cartoon graphics and is apparently trying to communicate hilarity using funny animal characters. There is a lot to trigger in regular game play and there is the potential to hit some big wins. The King of the Jungle Re-Spins I spoke of earlier is triggered if you hit three lion symbols across the reels. You will instantly be awarded with three re-spins and you will have all prizes subjected to a 3x multiplier. There is also the standard free spins bonus round that does kind of save this slot. You trigger this bonus feature by hitting three car symbols across the reels. You will be awarded with 10 free spins with a 2x multiplier. In addition to this, you can win up to three super spins during the free spins bonus round that could see you win even bigger prizes. Finally, if you hit three hippopotamus symbols across the reels then you will trigger the Hippo Bonus. This will immediately see you awarded with 150x your stake and this win could be a potential 750x your stake if you hit the hippopotamus symbols during the super spins that can be triggered during the free spins bonus round. This game isn’t going to win any awards for originality but the free spins bonus round plus the inclusion of the super spins and re-spins means that you could well get a lot of enjoyment and decent cash prizes from this slot. NextGen Gaming don’t produce many slots that rock my world but they do have appeal to certain slots players. In its defence, I will say that you should try it before you deny it. Have a play and just try to tolerate the lazy theme and name. It’s not actually as bad as you think it could be.